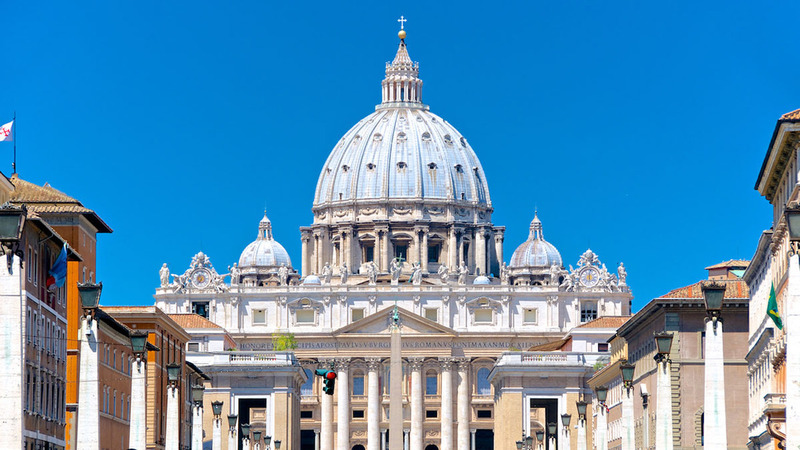 Enjoy an unforgettable tour of Saint Peter's Basilica, one of World's prime attractions. Come and enjoy the Queen of all of the Basilicas! The American philosopher Ralph Waldo Emerson once wrote, “St. Peter’s Basilica is an ornament of the earth … the sublime of the beautiful”. Enjoy a guided tour of the most important temple of Christendom, admire the Renaissance architecture and art by Donato Bramante, Carlo Maderno, Gian Lorenzo Bernini, and more. Marvel at Michelangelo’s world-famous “Pietà” sculpture. Pay your respects to Saint John Paul II, head of the Catholic Church from 1978 to 2005 and, definitely, one of the leading figures of 20th Century. Learn more about the “Chair of Saint Peter” or “Cathedra”, an ancient and legendary chair presumed to have been used by St. Peter, the first Pope of Christianity. A mystical and cultural experience you cannot miss! • The service begins and ends in St. Peter's Square. • On Wednesdays, access to St. Peter's Basilica & Square may be closed at the time of the morning tour due to the Papal Audience. • Clients must arrive at the designated meeting point 15 minutes prior to the scheduled tour time and present their tour voucher to the tour coordinator/guide. It is the individual responsibility of all visitors to arrive at the tour departure point. • Low cut or sleeveless tops or shorts are not allowed for both men and women. • Clients that do not adhere to the dress code will not be permitted entry to the Vatican.